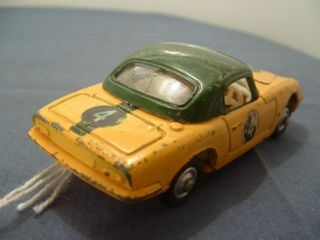 This model is the Corgi 319-A-4 Lotus Elan S2 in yellow with green racing stripe running over the bonnet and boot and with all green roof. 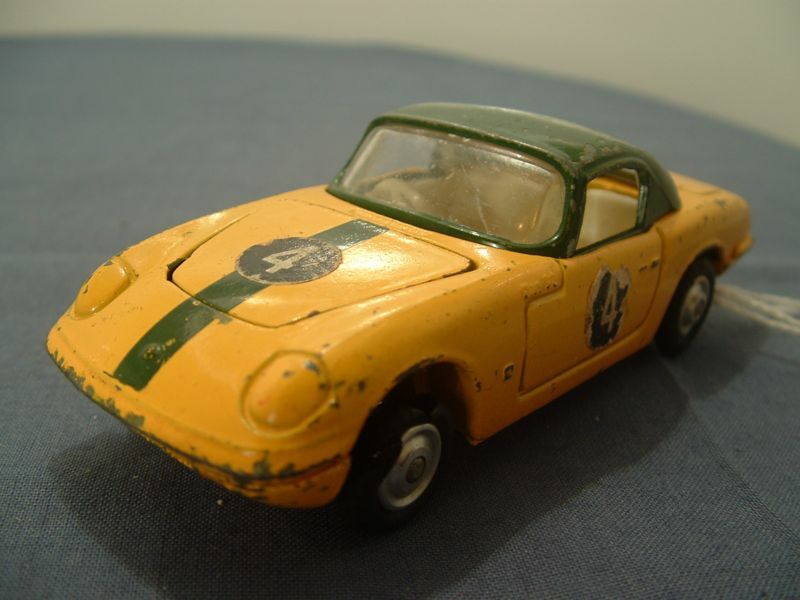 It has the racing number 4 on the bonnet, boot and both doors (paper labels). It has an opening bonnet to expose the chrome plated engine. The interior is white plastic with a right hand drive, white plastic steering wheel. The glazing is clear. The base plate is yellow painted metal and is marked with "Made in GT Britain" in front of the front axle area and Corgi Toys and Lotus Elan S2 behind the front axle. It is held in place with the usual two rivets. This model also exhibits a separate, removable "chassis" to which the axles and wheels are fitted. All wheels are of the shaped type - polished metal with a black "rubber" tyre. 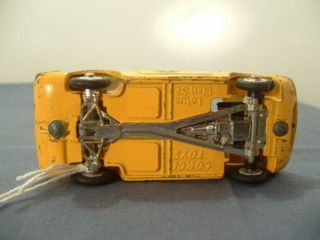 This model was issued between June 1967 and 1968 but is also reported in Dr. Edward Force's Corgi Toys [Schiffer, ISBN: 0-88740-364-6] as being used in the GS37-A set issued August 1966 to 1969 but with a red or black plastic interior.